Our Eugene, Oregon branch has recently moved to a new location, and now has a website. Please visit https://meditateineugene.org for more information. Kelsang Milob has been practicing Kadampa Buddhism for many years, both as a lay and ordained practitioner. Her heartfelt teachings reflect her sincere faith in Buddha’s teachings on compassion and wisdom. 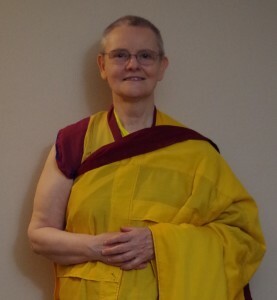 Milob is currently studying on the correspondence Teacher Training Program with Kadampa Meditation Center Washington, where she studied for many years. Copyright © Meditation in Oregon 1997-2018. All rights reserved.